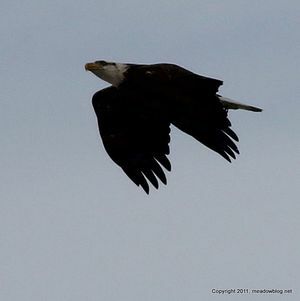 Wouldn't you know: The day after our free nature walk, we had a nice but fleeting look at a Bald Eagle. The bird flew from the Kingsland Landfill over Disposal Road and Transco Trail past Teal Pool. Got a couple of quick shots, above and right. A Red-tail had flown in from the same direction just seconds earlier. Also: American Wigeon have arrived and are in the Saw Mill Creek Tidal Impoundment. "In spite of the rising temps, the [Mill Creek Marsh] trails, on many stretches, have been quite icy with uneven footing. I use Yak Trax attachments on the trail running shoes along with hiking poles for better balance while running on the densely packed snow and icy spots. "You might want to forewarn the visitors for Tuesday." Well said — thank you. Forewarned is forearmed. Please be careful tomorrow. Should be a great day — as long as you watch your footing. Reminder: The free nature walk originally scheduled for Harrier Meadow in North Arlington tomorrow (Tuesday) at 10 a.m. has been moved to Mill Creek Marsh in Secaucus. The walk meets at the entrance to the marsh, near the Mill Creek shopping Center (directions are on this blog in the left-hand column). We’ll walk around the site, looking for wintering waterfowl, raptors and other birds – including a recently seen Eurasian Green-winged Teal. On a scouting trip last week we also saw Northern Pintails and Ruddy Ducks, plus plenty of American Green-winged Teal — and Red Fox tracks. We also noted that the trails are still at least partly covered with slippery, hard-packed snow, so wear non-skid footwear if you can. The walk is run by the N.J. Meadowlands Commission and the Bergen County Audubon Society.You will have to sign a standard liability release for this event. 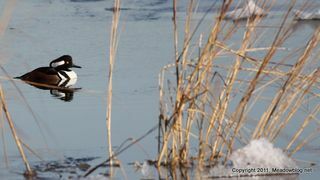 Check the Meadowlands Nature Blog, meadowblog.net, for last-minute updates. 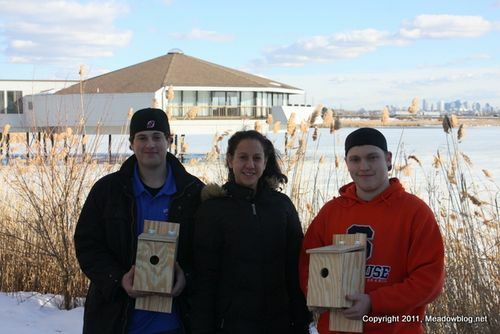 For his Eagle Scout project, Michael Effner of Troop 120 in North Arlington supervised the construction of 15 Tree Swallow boxes for the marshes of the Meadowlands. In the above photo, Michael (right) shows off a couple of the boxes with NJMC Naturalist Gabrielle Bennett-Meany (center) and fellow Troop 120er Michael Stringham (left).